It is a premiere eyesight protection filter for 27 inch widescreen-A monitors. The viewable screen size is W 23 9/16 inch, 584.7mm x H 13 1/4 inch, 336.5mm. NANOBLIND eyesight protection filter is a new invention and different from others in the market in terms of its unique design structure and performance. 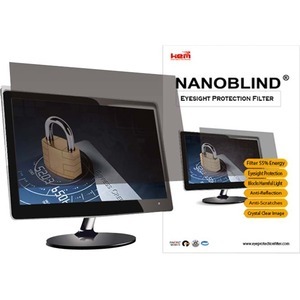 NANOBLIND eyesight protection filter has a multiple layer structure with hard coating for shock and scratch proof and anti-glare coating to eliminate light reflection on the surface. When looking at a monitor screen for more than one hour, the eyesight can be stimulated and irritated by the light energy. It may cause eye strain, dry eye, eye fatigue, eye irritation, conjunctivitis, blurred vision and other eye problems. NANOBLIND eyesight protection filter is the right solution for your eye care during long hours in front of a computer. It reduces the light energy by 50 percent for optimal eyesight protection.